Add the shallots and reduce the heat to medium-low. Sauté shallots for about 20 minutes minutes or until softened and caramelized. Once caramelized, remove 3/4 of the onions and set aside. Increase heat to medium-high temperature and add rice and garlic. Stir to coat with butter/oil. Cook until rice is a golden color, stirring constantly. 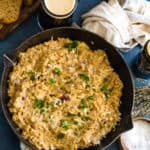 Once rice is golden in color, add the Guinness. Reduce heat to medium-low and cook until beer has almost fully absorbed into the rice, stirring regularly. Add 1/2 cup broth to the rice, and stir until the broth is absorbed. Continue adding broth 1/2 cup at a time, stirring regularly, until the liquid is absorbed and the rice is al dente, about 20 to 30 minutes. Remove from heat, and stir in shallots with their liquid, warm cream, and shredded cheddar. Season with salt and pepper to taste and garnish with fresh thyme. Serve immediately.